(CBS News) Tupac Shakur reunited with Dr. Dre and Snoop Dogg Sunday night at the Coachella Valley Music and Arts Festival -- at least that's what it looked like. The late rap star's likeness was recreated in hologram form for the music festival with some impressive technology. The hologram of Shakur was created by special effects production house Digital Domain, a spokesperson for Dr. Dre told MTV. Digital Domain is the company behind the computer-generated imagery that transformed Brad Pitt in "The Curious Case of Benjamin Button." The company's artists also won an Academy Award for the blockbuster film "Titanic." AV Concepts was charged with projecting the image of Tupac on the stage. Nick Smith, the company's president, told MTV it took several months of planning and four months of studio time to create the hologram. Smith declined to comment on the price of the project, but said a comparable project would cost from $100,000 to $400,000. Shakur's image was fully digital, El Ulbrich, chief creative officer of Digital Domain told the Wall Street Journal. "This is not found footage. This is not archival footage. This is an illusion," Ulbrich told the Journal. "This is just the beginning. Dre has a massive vision for this." Although the perception was of a 3D likeness of Shakur, the image was actually a 2D image. Shakur's likeness was projected onto an angled piece of glass on ground, which in turn projected the image onto a Mylar screen on stage. "Utilizing the Musion Eyeliner system, the 302 x 132 screen was customized by AV Concepts to descend onto the stage in mere seconds between sets of the performance to bring the infamous, deceased singer back to life," AV Concepts said on their website. "The most critical technical element was AV Concepts' proprietary Liquid Scenic server that delivered uncompressed media for 3 stacked 1920 x 1080 images, delivering 54,000 lumens of incredibly clear projected imagery." The Musion Eyeliner system they're talking about is a product of Dimensional Studios and "is an open system that uses a specially developed foil in reflecting images from high-definition video projectors, making it possible to show holograms of variable sizes and distinct clarity created using a proprietary software. The entire system consists of a truss box and a stage, where the virtual picture appears." 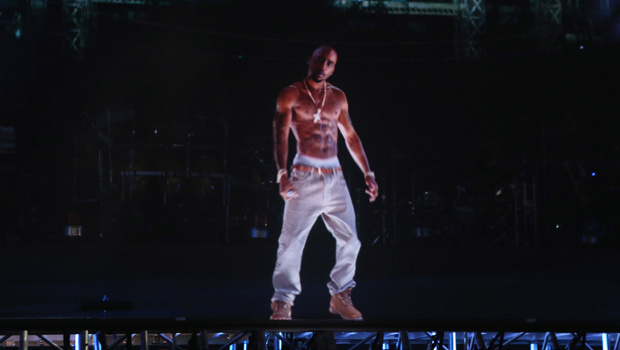 Shakur's hologram will make one more appearance on Sunday, the closing night of Coachella, but it may not be the last we see of the holographic rapper. Sources close to the matter told MTV that Dr. Dre and Snoop Dogg were considering taking Shakur with them on tour. "The report cites one option would be to tour in stadiums and involve other hip-hop stars like Eminem, 50 Cent and Wiz Khalifa. Another option is a limited tour that would only feature Dre, Snoop Dogg and the virtual Tupac in smaller arenas," said MTV's Kara Warner.